Shane Wallen might not see one second of action for the Oregon State football team this fall. The senior running back hasn’t played organized football since 2010, his senior year in high school. Realistically speaking, he’s sixth or seventh on the depth chart, stuck behind Storm Barrs-Woods, Chris Brown and a handful of others who didn’t have to sell themselves to the coaching staff for the chance to serve as scout-team cannon fodder for the next three-plus months. He is the longest of long shots. But he’s also fulfilling a dream and honoring his late mother by taking the final step of a long, challenging journey that began five years ago after his final baseball game and track meet at Pleasant Valley High School in Chico, Calif.
“I decided to come out because it was ultimately a dream and a goal of mine to play Division I football,” the 5-foot-11, 213-pounder said after a recent practice. “I knew that later on in my life I would regret it if I didn’t try. College of Public Health and Human Sciences Kinesiology student Shane Wallen is a senior running back for OSU football. Many others have shared that dream. Unlike most, however, Wallen was in a position to do something about it. A student intern in OSU’s strength and conditioning program, he worked with the team, was close to the players, and knew what it took to compete at the highest level. He also had access to new head coach Gary Andersen and his staff. “I jokingly asked the coaches about [playing],” he said. “One thing led to another, and now I’m out here,” a full 30 pounds lighter and significantly more cut than when his quest began back in January. “It’s been difficult,” he acknowledged. “Losing weight, getting my footwork right, getting faster and still maintaining my strength was difficult. But now I’m down to 205, my goal weight. “When they told me I could walk on and play, it was truly a dream come true. I was lost for words, I didn’t know what to say. It took a week or two for it to sink in and to actually realize that I would be out there living out my dream. 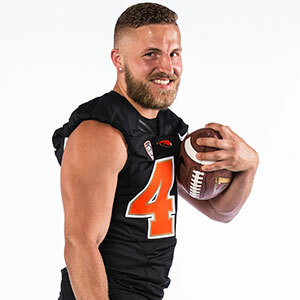 Wallen’s circuitous trip to Reser Stadium began in Aug., 2011, at Butte (Jr.) College in Oroville, Calif. Having received no scholarship offers out of high school, he hoped to rectify that by making his mark with the California powerhouse, the alma mater of former California star Aaron Rodgers. Life intervened, however. Before the season started he learned that his mother, previously twice stricken with cancer, was now terminally ill.
“It had spread to her liver, kidneys and back,” he said. “So I took it upon myself to [quit] football. “I still needed to get my education, because my mom always stressed that. I took the year off,” and spent the next 11 months helping care for his mother while also going to school and working to support himself. “She was basically in bed all day,” Wallen said. 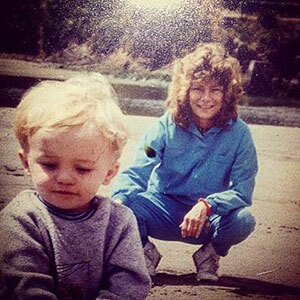 “I’d sit with her, talk with her, get whatever she needed and do whatever I could to be there with her. Vicki Wallen died on July 4, 2012. Shane used her untimely death as an inspiration to accomplish bigger and better things. Wallen worked three jobs so he could remain at Butte and follow his mom’s wishes to complete his education. One of those positions was in Butte’s strength and conditioning program, as close as he could get to football without actually being on the field. After graduating, Wallen transferred to OSU in Sept, 2014, as a junior, as an Exercise and Sport Science (now called Kinesiology) major in the College of Public Health and Human Sciences with an internship in the strength and conditioning program. Wallen said his experience with cancer has made him empathize with others who have also been impacted by the deadly disease. 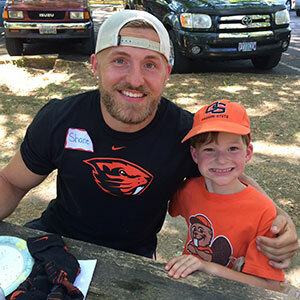 Earlier this summer, Wallen was one of 11 OSU and Oregon football players who joined a group of youngsters whose lives had been impacted by cancer on a fishing trip on the McKenzie River, under the auspices of the Oregon Candlelighters and the Northwest Steelheaders. Wallen, OSU teammates Malik Gilmore, Ricky Ortiz, Caleb Saulo, Jalen Grimble and Fred Lauina, the Ducks and the kids spent the day relaxing, swapping fish stories, and thinking about anything other than cancer. “It meant a lot more to me than some others because I’ve have a personal experience with cancer,” Wallen said. “Once I learned of the opportunity I had to go. It was a no-brainer. “I got to meet these two kids, Cressey and Keylin … I was on the boat with Kres all day, we caught a couple fish, we talked and had a great time. I wouldn’t trade that day for anything. That trip wasn’t a one-off; Wallen expects to re-connect with Kres and Keelyn at the Sept. 25 Stanford game. He’ll remain in contact after that if they want to, and will return to the river with the Candlelighters in 2016 if he can. This story was originally posted at OSUBeavers.com.